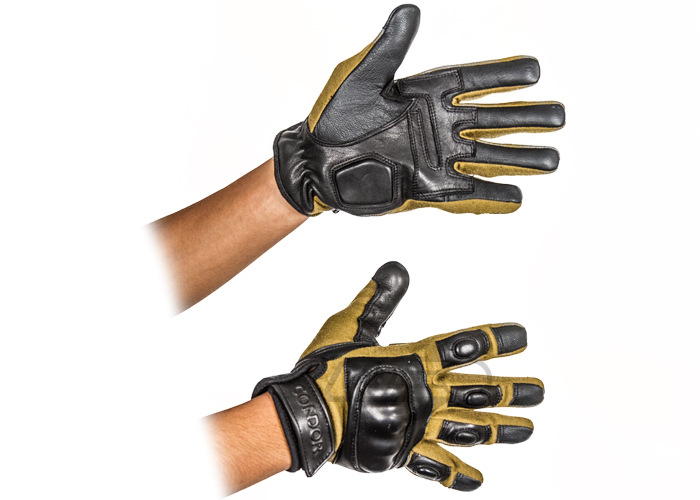 The Condo Syncro Tactical Gloves are designed for the modern operator. Constructed out of premium goatskin leather along with TouchTec Nanotechnology. The TouchTec leather allows the use of tactile technologies without skin contact. Dupont Nomex Fabric is constructed throughout the glove for flame resistance and flash protection. These flame resistant fibers provide peace of mind in harsh environments. The three dimensional weaves provides for a more comfortable fit and durability. the Syncro glove was weaved to include gussets for better air ventilation and a longer lasting construction. The adjustable cuffs with hook and loop offers quick and easy adjustment for the user. Lastly, the reinforced padding in critical areas offer extra protection such as the plastic insert for the knuckles and close cell foam for fingers and the palm. These Syncro Gloves come in a tan finish with black accents and are a great way of protecting the vulnerable parts of your hand from impacts. TOTALLY WORTH IT!!!! I never felt pain from a BB's impact anywhere, even when not padded. They feel like a tank on your hands. The only thing is, they are coyote, not tan, but there gloves. So if you are worried about colors with GLOVES, then you are very picky or need a very certain Loadout. But all the features plus the look, wich is unique being black AND coyote, plus the comfort PLUS the protection= Best.Gloves.EVAR! c:. And they are so cool, you can use iPhones and stuff with them! They have a pretty good grip too! A few black particles came out when first worn, but nothing else came out afterwards. Not as maneuverable as thinner gloves, but you get used to it. Having purchased this pair of gloves I can say that I've never used anything as comfortable as these (maybe besides motocross gloves). They fit well (I am 5' 7" with larger hands) and gloves are usually a bit tedious for me. My friend can wear them as well even with different sized hands, this product is almost universal in size. Will suit any tan/black set well. I have to put something here so Ill say they are a bit pricey at the $50 mark, but id buy these three times for the same quality in most any gloves I've bought before.